No matter where on earth you travel, you can always find two things to quench your thirst: Coca-Cola and Guinness beer. In Southeast Asia Coke is served in all manners including plastic bags filled with ice, but the best way to enjoy a Guinness remains at a traditional Irish pub. 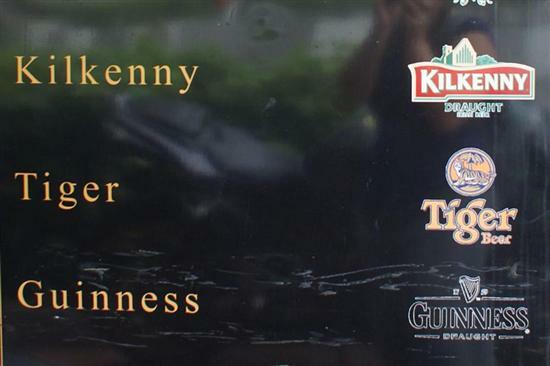 With St Patrick ’s Day just around the corner, now seems like the perfect time for a round-up of Irish pubs in Singapore. It can’t always be Tiger time. Molly Malone’s: One of the dozens of bars near the Singapore River, Molly Malone’s is Singapore’s original Irish pub and arguably its best. With a great selection of imported Irish beers and whiskeys, friendly crowd, and resident musician playing Irish folk songs, this is as good as it gets this side of the Emerald Isle. Come hungry because they have a full food menu with Irish stew, shepherd’s pie, and beer-battered fish and chips. Pints are S$12.50 until 20:00 every day and their annual St Patrick’s Day street party is not to be missed. Muddy Murphy’s: If this long-running Irish pub looks too authentic to be true, it’s because it was built in Dublin then shipped to Singapore piece by piece. The bar has seven beers on tap including Guinness, Kilkenny, Strongbow Cider and Old Speckled Hen. The pub menu includes beef and Guinness pie and they do a traditional roast every Sunday. Muddy Murphy’s is very popular and when there’s a live band the crowd spills out into the patio along Orchard Road. Durty Nelly’s: Like Muddy Murphy’s, Durty Nelly’s has a cosy cottage pub look and a wide selection of Irish and English beers on tap (surprise — they’re part of the same chain). Its location in the Marina Bay business area makes Durty Nelly’s popular with the post-work crowd, but the bankers are known to loosen their ties after a few pints. Happy hour is from opening at 11:30 until 21:00 every day. Obama says drink more green beer. 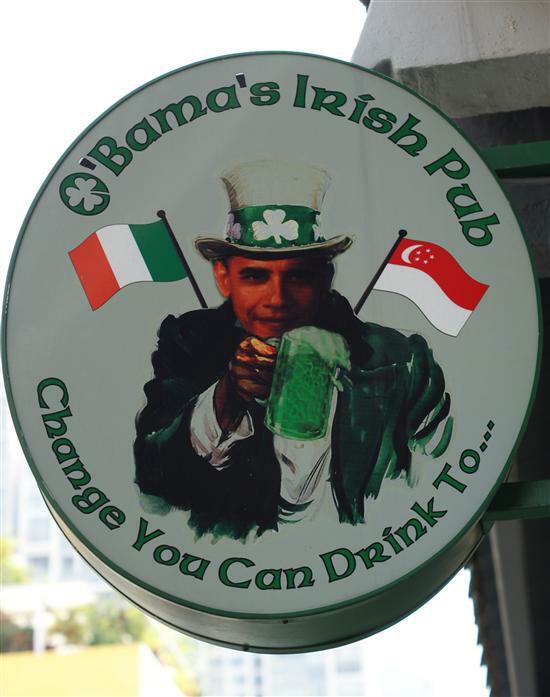 O’Bama’s Irish Pub: This pub definitely wins for the most original name but, more importantly, also has the cheapest drinks (from S$9 for bottled beer and S$12 for pints) and real live Irish barkeep. There’s a live band most nights of the week, a big TV to watch the game, free WiFi and yummy Irish stew. Look for it in one of the restored shophouses around Tanjong Pagar. 54 Tras Street, T: 6225 1090 ? The Dubliner: An Irish pub with a Singapore twist, The Dubliner is located in a colonial-era mansion just off Orchard Road. The atmosphere is warm and welcoming, plus there’s a pool table and massive TV to watch sports. There’s an impressive selection of beers, ciders and shooters (including the “Irish Flag” — Baileys, Creme de Menthe and Grand Marnier), but prices are higher than most. Scruffy Murphy’s: Out at East Coast Park, Scruffy Murphy’s is a small Irish pub set right by the beach. Grab a seat at their outdoor beer garden and order up a pint of Guinness or Kilkenny for bargain S$10 during happy hour. Sadly, their St Patrick’s Day 2012 party is also their closing party, but they’re going out with a great craic! And if you happen to be heading to Phnom Penh for St Patrick’s Day, we’ve already rounded up the Irish pubs there here.